While the 1st part is very intuitive. The 2nd part generally gets ignored and causes confusion. Can we change the bar to show the value from the formula instead? Why I haven't I received the "Curious" badge? One major problem here is that users cannot calculate their question record on their own once any of their deleted questions is past 60 days old. They can't determine how the number was calculated, will assume it's wrong, and just end up here creating bug reports about the number we're showing being incorrect when it's not. What you propose doesn't solve the problem. Showing a seemingly arbitrary number that they can't verify themselves doesn't help the confusion all that much. What if someone has a positive question record without meeting the first criterion (ask a good question on 5 separate days). You will have the same confusion because the user doesn't have the badge. It doesn't matter how intuitive something is - if the bar shows 100%, a user will expect to get a badge. Another issue is people are used to the bar always going up. Sure there are situations for some badges that may cause it to slide back a little, but usually the changes are small and likely unnoticeable, but with that specific formula for "positive question record", you are likely to encounter larger variations in the score without doing anything just because of the dynamics of voting and closing and reopening and deletion of questions. In short, this is not going to work, you'll just create different confusion and end up with the same "Why didn't I get my badge" questions, but you'll also now see "Why does the progress bar for the "Curious badge jump around so much". This being said, the status quo is obviously confusing given the questions on meta, but it is hard to capture progress for a task with multiple criteria in a single bar. 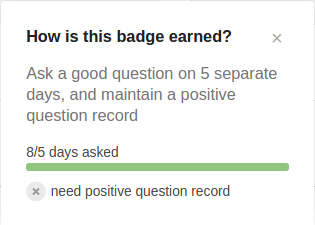 Maybe the only solution is make 50% of the bar about the 5 questions, and the other 50% about the positive question record - but that doesn't really fix the confusion except now it won't show 100% until someone qualifies for the badge. Or you just remove that badge from the "track next badge" feature.